- supports now live input sound thanks to Fmodex, which is a high quality multi-platform sound library. It has a per-channel FFT analysis built-in, an ideal feature if you want to have some beat detection stuff and sound reactive graphics. There are tons of great functionnalities available through a clean and well documented interface. And by the way : it’s free to use for non commercial products ! - supports now scene filtering on top on scene rendering. 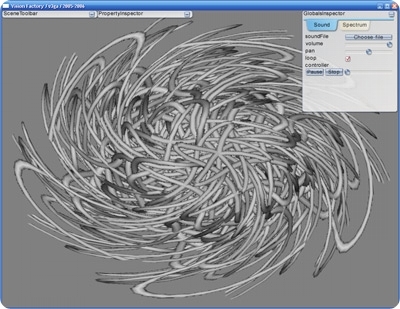 It’s now possible to chain 2D filters (see screenshot, a twirl filter was applied on the grey mesh), each of them having access to spectrum analysis for sync effects. - supports flash movies playing, thanks to GameSWF library. - supports vertex and pixel shaders through Nvidia CG library. - can play RQBox scenes. RQBox is a Max/Msp-esque tool Mike (my friend & coworker) and I began to develop in the summer 2004. 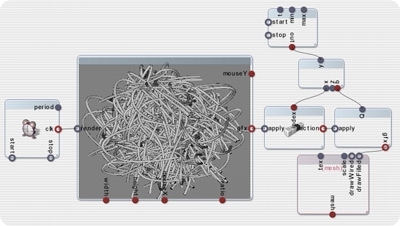 It allows to plug basic blocks for quickly prototyping 3D scenes. Once a scene has been composed, it’s possible to export it for playback and have some of its properties accessible from “outside”, like wires in a microchip. It’s in its early stage of development though. I am currently working again with Jody and Luke from Hudson-Powell studio on a really cool project which will be using Vision Factory as a tool for generating images (for printing). It’s still in development at the moment. Once the project will be released, I will try to put a version of this piece of software online (Mac / PC). Scene played in Vision Factory with a “twirl” filter applied.